New tales of the Ghost-Finder! 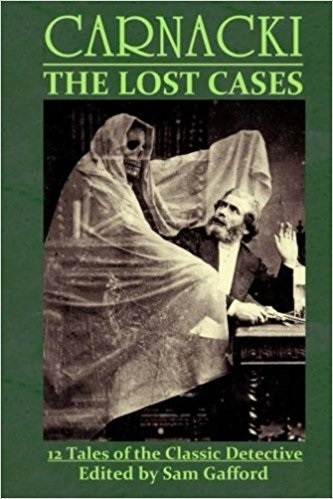 Thomas Carnacki, the Ghost Finder, was the creation of William Hope Hodgson. The original stories were published in 1913! The version most people are familiar with was published in 1947, and include three stories that were not in the original book. The stories are written to a specific formula. Carnacki invites four friends to his home at 472 Cheyne Walk in Chelsea. These men are only known by their last names: Arkright, Jessop, Taylor, and Dodgson (obviously Hodgson in disguise!) who writes up the stories. They have a meal during which the guests must not ask questions. After eating, they retire to what Dodgson calls “their usual chairs and nooks” while Carnacki settles into his great chair and begins to recount an adventure. I will give a SPOILER alert but try not to give too much away. • “The Steeple Monster Case” by Charles R Rutledge finds Carnacki facing something in the bell tower of a church… This one breaks the story format, but the tale redeems itself! • “The Dark Trade” by John Linwood Grant is about a horrible room that smells of the sea and unwashed human bodies… This one takes Best in Book! Encore!